There is a chasm between what customers are expecting in terms of personalization and what marketers are providing. According to findings from research conducted by TimeTrade: "93 percent of retail decision makers claim that personalization is a strategic focus but only 25 percent of shoppers say they receive a consistent, personal experience across channels." According to TimeTrade CEO, Gary Ambrosino, "to remain successful … brands must … ensure that service is prompt, personalized and consistent across channels." Personalizing per your customer's individual needs is a 360-degree pursuit. It doesn't stop at the home page of your website or your consumer's email inbox. Personalizing the entire brand experience with Human Data that addresses individual's lifestyle and interests is critical for building long term relationships versus one-shot sales. Per recent research conducted by our firm, marketers must make a profound shift from implicit data (information data mined or provided by customers for short-term interests or needs) to explicit self-profiled preference Human data (information provided by customers in the Preference Center of a site or through dialogue boxes). Findings from 2500+ hours of VoC research interviews for clients such as Gilt, MassMutual, IBM, HP and QVC, indicate that implicit data is simply not delivering on customer's expectations of value. To drive high levels of relevance and personalization, Millennials in particular, are willing to provide deep explicit Human Data regarding their preferences. Fitness company, Under Armour offers "UA Shop", a lifestyle-based Custom Shopping App for their customer that provides a deeply personalized experience based on a shopper's athlete inspiration, workout history, and previous purchase history. For example, depending on the type of activity logged into a connected fitness tracker and their geographical location, a shopper will be presented with specific product suggestions relevant to their situation. 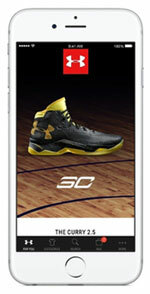 Jason LaRose, Senior Vice President, Revenue, at Under Armour noted about the app, "This app was created to … complement our existing in-store experiences … We are now able to provide custom experiences across our various categories specific to our diverse customer base." High-end retailers such as Saks Fifth Avenue have long offered in-store shopping services, but with today's busy on-the-go consumer, that service needed to be upgraded and expanded to include a virtual component. Today, Saks lets its customers connect with Saks Associates 24/7 to create personally curated saks.com boutique pages, via a dedicated URL. Interaction also includes live chat, email or scheduled appointments. In addition, Saks Associates can showcase personalized "storefronts" to customers through email and social media or via a mobile app. "This is a highly personalized online solution to selling …" commented Marc Metrick, President, Saks Fifth Avenue, "with access to Associates 24/7, personalized services and more, we finally have the ability to bring the high-touch Saks experience and store environment online." Today personalization is about putting the consumer in the driver's seat to determine how they want to engage, what they want to engage about, and when that engagement should take place. Brands need to become nimble in order to provide the types of personalized experiences their unique customers require.